Dodge the beachballs or you lose points! Collect the ice cream cones to score points! Program Scratchy to move using the keyboard keys! Program a variable to keep score! Program sprites to move randomly! If you didn't attend chat, please watch the virtual lesson recording following along in Scratch as you code your program. 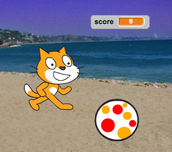 See if you can finish programming the beachball to bounce around the stage randomly! 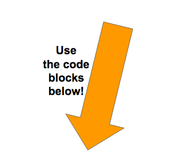 To help get you started, all the code blocks you will need are shown below! Can you arrange them to program the beachball to bounce randomly? Remember! You can always click the ? 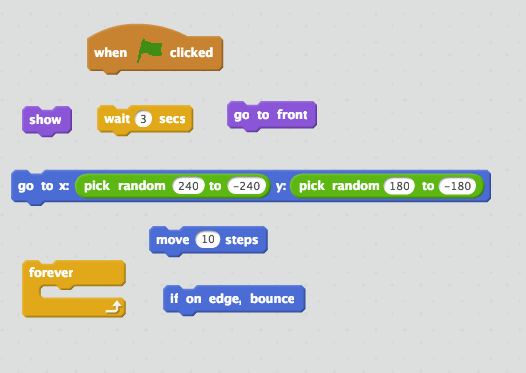 button in Scratch for help!